The vice president of operations at one local factory likes to keep things simple. “I just like to do my job,” said Vonda Howell, who does that job every day at Trion Industries. Founded in 1965 in Brooklyn, Trion Industries is a company dedicated to manufacturing some of the things that exist in your daily life that you might not think about — namely, the hooks and other products used to display items at stores. 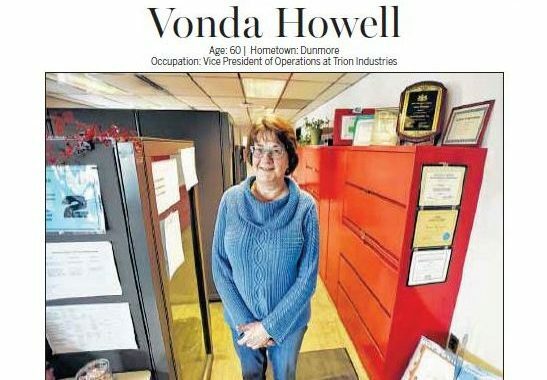 Trion relocated to Wilkes-Barre in 1982, and Howell’s history with the company started a few years later, as she recently marked her 20th year with the manufacturer. Howell was originally hired to manage the sample room, and eventually grew to her current position, overseeing much of the company’s operations. She chalks up much of her success with the company to the lessons instilled in her by her early life, growing up on a farm in Iowa, where she learned to have a familiarity with both machines and working in general. 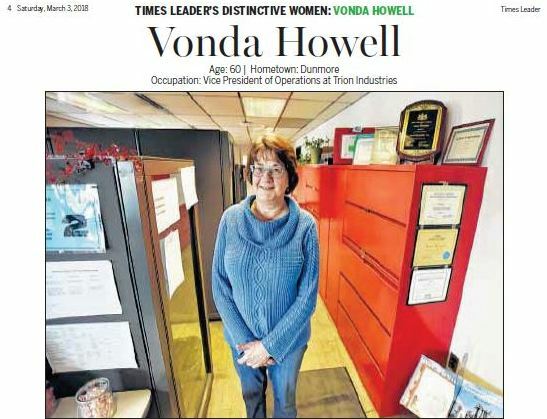 It was that work ethic that led the Times Leader to honor Howell as one of the Northeastern Pennsylvania’s Distinctive Women. As for how she ended up out here in that different environment, Howell said that one can be owed — or blamed — on one person: “Cupid,” she said with a laugh. While Howell was once married, she spent much of her time with Trion as a single mother, something she’s immensely proud of. “When I look back, I think to myself, ‘How did I do all that?’” she said. Now, Howell’s two daughters are fully grown, but as they were growing up, she said, Trion was extremely helpful in helping her juggle her life. And, what’s more, Howell said that the employees at Trion have become like a second family to her. Howell admits that she has taken a bit of a strange path to success in the world of manufacturing, originally studying psychology at York College in New York. She said it all comes down to sheer determination. “I just have a love of the business,” she said. Howell said that, in many ways, working in manufacturing can be difficult for a woman, considering that it’s such a male-centric field. “I’m grateful to be here; it can be difficult when you’re a woman in this field, but when they’re so good to you, it inspires you to be loyal,” she said. Howell led the Times Leader reporter out onto the factory floor. Outside of her office, Howell seemed to shine. Surrounded by large manufacturing machinery — which she cheerfully noted came from companies all around the world, ranging from Italy to South Africa and points in between — Howell seemed far more at home than when she was behind her desk. Walking through the factory floor, numerous employees greeted Howell with a smile and a wave, making her claims of it being a second family suddenly feel less like a cliche. “This really is the best factory,” she said with a smile.